Phil's incredible sofa is one of the things that people really remember about our house. It's huge (Phil can stretch out fully on it), it's as welcoming and comfortable as a grandma's hug and a bowl of warm porridge, and it moulds itself to your body like a glove. So many of our friends when they come to our house go straight to the sofa, settle in and don't move for the rest of the day. Some even fall asleep there (miss g!!). After a very good life, the sofa was starting to get a bit dog-eared, stained and was shedding feathers like a sick rooster, so the time had come for it to get a new lease on life. 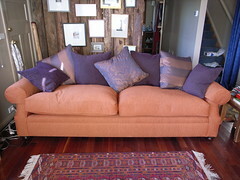 A trip to Warwick fabrics later, and thanks to the fine efforts of Springwood Upholstery Services, we now have a new look sofa that is even comfier than the old one. It's replumped and lights up the room like a sunset. p.s this will probably be the last non-baby-related post for a while as we're off to hospital tomorrow, so enjoy it! We will try not to overwhelm this blog with baby stuff, but can't promise anything!